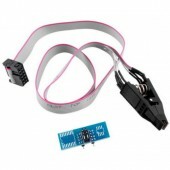 1) Read and write 8 pin and 16 pins chips those commonly used on computer motherboard, laptop, LCD, routers and home appliances. 2)Read and write memory SPD DDR1/DDR2/DDR3 Free demolition chip, especially support 34C02 and other special part numbers. 4)Support all series of 24,IIC EEPROM Memory.Besides, it can automatically identify chip model from 24C01 to 24C16,Automatic identify write protection level of the 24 series' 7th pin. 5) Support all series of 25 and 26 SPI FLASH Memory,support identify the chips part number automaticly,the capacity is up to 256Mbit. 6) Support all series 93 MircroWire Memory,including Japanese special chips. 7) It is the only one programmer which have the function of supporting RTD2120 chip’s double bank read and write online. Including the BANK0 which the firmware in and BANK1 area ,which menu in. It can read double BANK in only 6 seconds.Support RTD2122 ‘s three BANK read and write online. 8) Support reading and writing DDC-EDID data of LCD display and LCD TV online. Very easy to solve EDID data problems. 9) Support reading and writing laptop screen EDID data online, very easy to solve the problem of DELL and SONY laptop’s choose screen. Our store have screen wires sale. 10) Support Leroy, Ding Branch, Rainbow Star, Triumph, Kang Yue and Wang Jie general driver board. Write the driver board MCU by VGA port without taking the components out of the board. The programmer software has a new additional function, it can restore the chips. If the board has been damaged when programming, it can be work normally with this function. Reduce many matters. 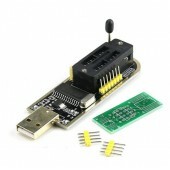 LCD USB Programmer PC Repair Tools RT809F Serial ISP Programmer Support 24-25-93 serise IC. RT809F is much stable then EP1130B,the qaulity is much better then EP1130B,Besides,it has English version sftware. 11) Support to read and write firmware of LCD display and TV motherboard online and out off line. 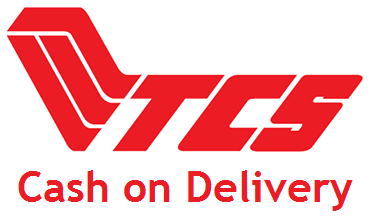 Support TPV, Proview, Samsung, LG, ACER, LENOVO, HP, IBM, BENQ, HKC, Hisense, Skyworth, Konka, Changhong, TCL , Haier, Prima and other major brands, support NOVATEK, MTK, the MST, Genesis, TSUM, SE, FT, REALTEK the Winbond WELTEND, MySoN, China and Asia micro and PIXELWORKS chipset solution, you can use the official ISP software or third-party software, take into account the functions’s integrity and the user's ease of use. 12) Support Samsung, Philips, AOC, BENQ, NESO use NT68F63/NT68F632/NT68F633 series MCU and WT61P4 models. Can read and write programmer free disassemble. 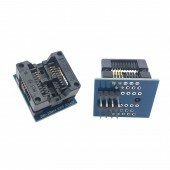 The Samsung LCD has a common problem of missing programmer, you can solve this problem free disassemble with it. 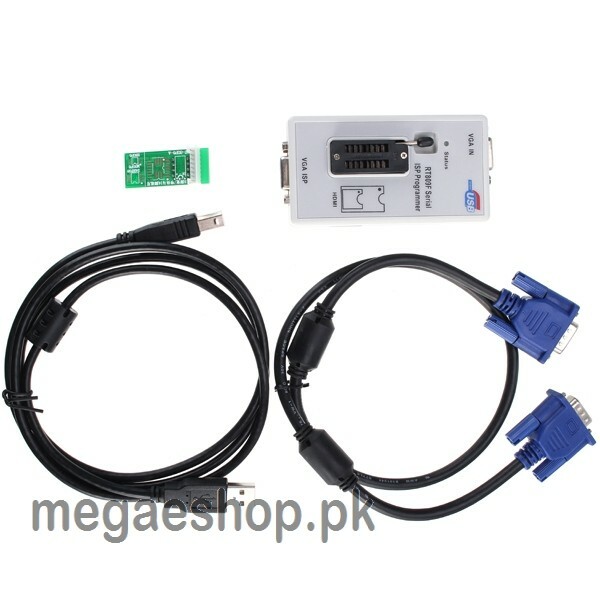 It has a special function of reading MCU original programmer online. It can read and save original programmers from the good MCU.Besides, it supports lastest SE1059 series’ reading and writing. Easy to solve samsung’s balck screen problems. 13) Support WINBOND series MCU’s programming online, such as W78E65P-40,it can replcace the MCU of M6759,SM5964,SM89516,P89C51RD andTP2804 which are very easy be damaged. 14) Support MTK series LCD and DVD program online. Such as MT2389,MT1379,MT8223 and 8226 etc. 15) Support SUNPLUS series DVD program online. 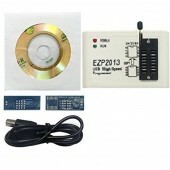 Such as 8202D 8202S,8202L,8281 and 8200 etc. 18) Programming the internal high-speed MCU control to upgrade PC client software to complete the programmer's own feature upgrades, more compatible models; using USB interface, power supply and control, eliminating the need for bulky power adapter, easier to use; locking seat of the programming interface, there are anti-static and port the IO protection measures to ensure the reliability of the programmer. 19) Recordable models constantly add, if there are special needs, you can contact with the company, part of the chip models can remotely add. 24,25,26,93 series chip and official ISP software, users can also customize the video tutorial to add, convenient to use. Gift 8G procedures and information, and provide long-term technical support, to welcome major brand service station order, such as over one hundred customizable software LOGO and special features.